Get on the TSJ Bus March 1! Bus will leave from 1100 S. Hamilton. On February 17, the Illinois House Education Committee passed by a vote of 15 - 9 (along party lines) the bill for the Elected Representative School Board (now HB 557, formerly HB 4268). The next step is that the full House has to pass it-we have 60 pledged "yes" votes (enough to pass the bill), BUT we want to make SURE that the vote occurs before the March 15primaries. The February 18th Springfield Rally Day was cancelled because the Legislature took the day off!, so we have RESCHEDULED to MARCH 1. Sign up to get on the TSJ bus to join hundreds of other parents, teachers, community members, and students in Springfield, Tuesday, March 1, to let legislators know we want an elected representative school board in Chicago-now!! We will have a rally in the capital and talk to legislators. The time is now! 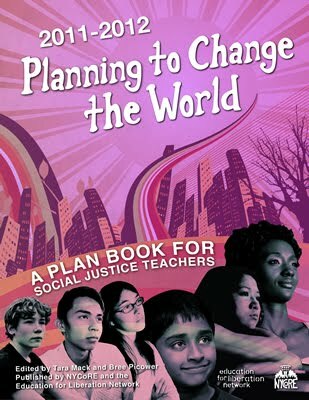 This is our alternative to Rauner's state proposal to take over our schools, and Rahm's racist corporate agenda to break the CTU, cut resources to neighborhood schools, and privatize. When parents and grandparents have to go on a 34 day hunger strike to get a quality neighborhood high school (Dyett HS), it's time for an elected school board that represents the people who actually attend and teach in CPS schools. * Space is limited!! Reserve your spot on the TSJ bus TODAY! Fill out the form here! And please-we want to accommodate everyone who can go, so please do not commit unless you are sure that you can make it (to the best of your knowledge, of course!). Keep contacting your IL legislators to let them know you want an elected representative school board in Chicago-now!! You can learn more about this fight and TSJ's role in it on our ERSB Resource Page. It's time to show our strength. CPS has done it. As expected, they have announced layoffs of 1,000 or more educators in a letter sent today to the CTU. They also said that they would take 7% of our pay through the pension pickup within 30 days and redirect anti-poverty funds to general expenses. The union spent fifteen months trying to get a serious offer out of the Board. After only three weeks of negotiations, CPS made an offer that (1) relied on a reduction of more than 2,000 educators from the system, (2) made no provision against ballooning class sizes as a result, and (3) included nothing but the vaguest indicators of where new revenue will be pursued. The mayor has had every opportunity to pursue revenue from his wealthy friends and backers. Instead he has targeted educators and students to pay for the Board’s mismanagement. CPS has shot down the flag of truce and peace talks are over. 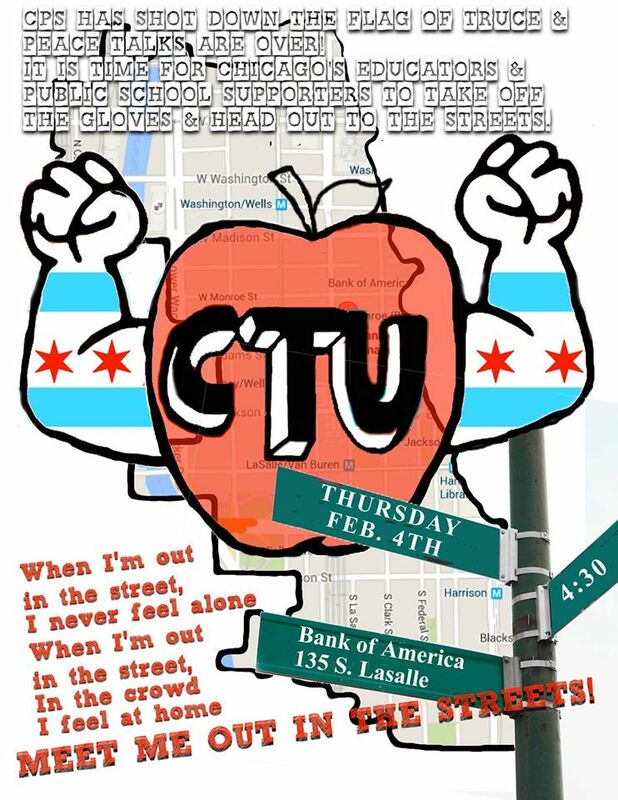 It is time for Chicago’s educators and public school supporters to take off the gloves and head out to the streets. We will start the march at Bank of America at 135 South Lasalle and finishing at City Hall. Please note: THIS WILL BE A NONVIOLENT AND SAFE RALLY! Attending the rally will not put you at risk of arrest or sanction.